Imagine it’s February 19, 2016, and you’ve just retired on your 65th birthday. You’ve worked hard, saved diligently and now have a $1 million portfolio—what you hope will be an adequate nest egg for retirement. You are sitting down with your financial adviser discussing your asset allocation for the next 10 years. And for argument’s sake, let’s assume you can’t change your allocation mix between stocks and bonds for exactly one decade. What percentage will you allocate to stocks and how much to bonds? Your financial adviser explains that the conventional wisdom suggests having an allocation to stocks equal to 100 minus one’s age. So in this example for a 65-year-old, the equity allocation would be 35%. But, you protest, stocks are risky. And you are risk adverse. Besides, at the end of this hypothetical period you will be 75 years old, so at that point your conventional wisdom stock allocation should only be 25%. So, after careful collaboration with your trusted adviser, in a Solomon-like manner you anticipate where you will be in a decade and decide to allocate 25% to stocks and 75% to bonds today. To see how this follow-the-conventional-wisdom approach works out, let’s take a look at the math. To fill your bond allocation, you invest $750,000 in the 10-year Treasury, which yields 1.75% as of February 19, 2016. For your stock allocation, you invest $250,000 in a low cost equity index mutual fund that tracks the S&P 500. As of the same date, the S&P 500 is at 1,917.78. The operating earnings for 2016 are projected to be about $122, so the index is trading at an estimated P/E ratio of 15.75x (compared to a historical average of 15.5x). 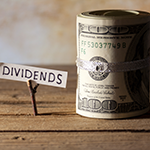 On a per share basis, the trailing 12-month dividend payout was just under $45, which represents a dividend yield of 2.34%. Like a lot of “conservative” investors, you’re fixated on yield to fund your retirement income. So let’s recap: the 10-year Treasury yields 1.75%, and the S&P 500 dividend yield is 2.34%.—a difference of 0.59% (may we round it to 60 basis points?). In other words, the S&P 500 is paying you 60 basis points more in income annually than the 10-year Treasury. So you effectively get 10 years of earnings growth, dividend growth and potential for capital appreciation…for free. But what about the risk of stocks declining over the next 10 years? Let’s examine the historical record. Looking at all 10-year rolling periods from 1950 to 2015 from the chart below, the lowest average annual total return for the S&P 500 over any 10-year period was -1%. 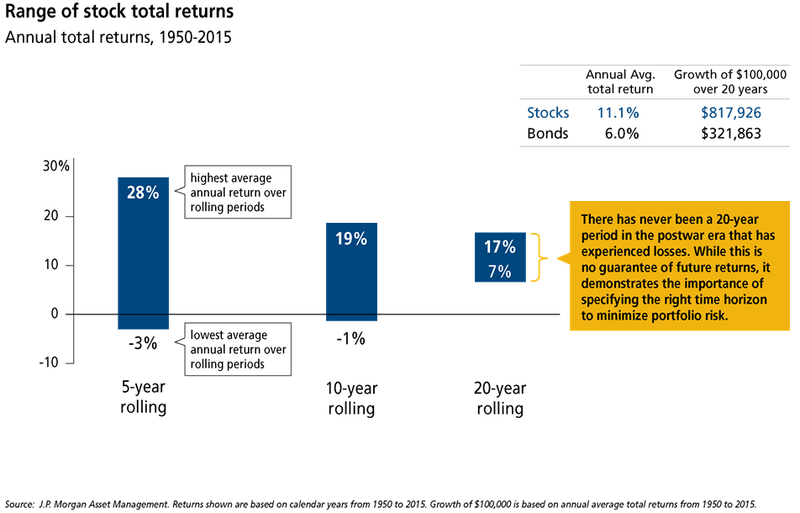 And the best average annual return for any 10-year period was 19%. If you extend the analysis to 20-year periods, which is much more representative of a typical retirement period, the lowest average annual return is positive 7%, and the best average annual return is 17%. In fact, there has never been any 20-year period in the postwar era that has experienced losses. While this is no guarantee of future returns, it demonstrates the importance of specifying the right time horizon to minimize portfolio risk. In fact, the average annual return for stocks and bonds over this 65-year period was 11.1% and 6% respectively. At these compounded rates of returns over a 20-year period, $100,000 will grow to $817,926 invested in stocks and only $321,863 if invested in bonds—a difference of 154%. And one would think that the tradeoff for access to this type of premium return would at least be a lower current yield. But, at today’s level, even that is not true. There is nothing to give up or pay in terms of yield sacrifice. As an investor in stocks, you get to have your cake and eat it too. So now to come full circle on the math. But for ease of comparison, let’s give you a mulligan and assume that the $1 million portfolio was initially allocated in equal 50% portions to bonds and stocks. In dollar terms, the $500,000 invested in the 10-year Treasury at 1.75% will generate a fixed income of $8,750 in the first year, and every year thereafter, for a total of $87,500 over the decade. The $500,000 invested in equities will yield $11,700 in the first year alone. If history is any guide, the initial S&P 500 dividend of $45 per share will grow at 5% per year to about $73 at the end of the 10-year period. On this basis, the dividend income in year 10 would be equivalent to about $19,000 [$73 dividend in year 10 / 1,917 initial S&P price = 3.8% dividend yield x $500,000 initial investment]. Even if dividends were frozen at the first year level, you still would have $117,000 in cumulative dividend income over the decade—one-third more than the total income from the 10-year Treasury. In summary: stocks currently yield more than the 10-year Treasury, dividends grow over time while interest income is fixed to a bond’s coupon level, and over 10 to 20-year time horizons, the historical evidence suggests that stocks nearly always appreciate in value. Since our starting point today is with stocks valued dead in line with their historical multiples (P/E of 15.75x estimated earnings compared to long-term historical average of 15.5x), there is no rational basis to believe that this time will be different. Given the choice between stocks and bonds, and since stocks currently yield more than the 10-year Treasury, why not exercise the free option on 10 years of earnings growth, dividend growth and capital appreciation by owning equities?